The year was 1922. Thomas Lynch and Dorothy Leigh were newly wed and living in the small, cozy cottage at 2501 Preston Street. Dorothy was pregnant with twins and suffering from uremic poisoning. Her doctor told her she would probably nor survive the birth of her babies. On the evening of February 2, 1922, Dorothy died while giving birth to her daughters, Dorothy and Elenore. Devastated and grieving, Thomas Lynch feared he would not be able to care for his newborn daughters. As it turned out, Dorothy’s aunt, Bertha Holway and her husband, Arthur, lived behind the newlyweds in a small house at 1916 Vestal Street. They immediately adopted the twins and raised them as their own. 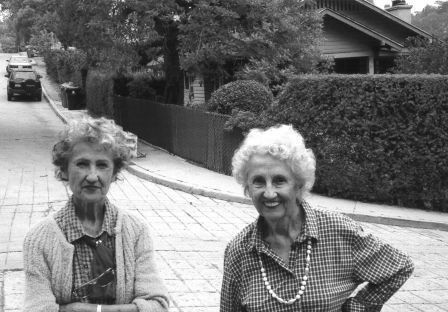 As children, Dorothy and Elenore spent their days playing in the yard of their small house on the corner of Vestal and Baxter Streets, and on the staircase that runs from Baxter up to Preston Street. Arthur Holway had purchased the vacant hillside in 1912 and then built four small houses on the property, two of them facing Vestal, the other two behind them facing Preston Street. Sometimes the twins would walk up the Baxter Street stairs with their mother to walk their dog in the park. “Back then, there was nothing up on that hill, no houses, no paved street, there was nothing but the park up there,” says Elenore. The small former storefronts along Echo Park Avenue used to be a place to stop in for a quick lunch, for eggs or milk, or even to get a haircut. Arthur Holway died in 1952. Bertha left Echo Park for West Covina in 1956. The twins inherited the property in 1971 after Bertha Holway died. Since then, the four small bungalows on Baxter and Vestal have been the homes of many, but the care and upkeep of the bungalows by the twins has remained steady. Until recently, you could often find Dorothy and Elenore pruning trees, or pulling weeds from the hillside, but combined, they have 15 grandchildren and they’ve finally begun to let them share the responsibility for the upkeep of the properties. On a recent afternoon, Dorothy and Elenore had driven in from West Covina with Dorothy’s sons Tom and Joseph, and one of Elenore’s grandchildren, to clear some brush from around the property and sweep the stairs. Dorothy put her hands on her hips and looked satisfied as she surveyed the hill that has been in her family for nearly 100 years. “We don’t try to do everything ourselves anymore, ” she says, ” after all, it will be theirs’ someday.” Dorothy recently underwent surgery for breast cancer. She is now going through chemotherapy and she says she is doing well and feeling good. The twins will celebrate their 84th birthday on February 22, 2006. This article appeared in the Winter 2006 issue of the EPHS News.